Sebastian Vettel wrapped up his fourth successful championship campaign in India today, winning the race and taking his points tally to an unbeatable 322. The maths was always in his favour, but Vettel kept a clear head despite watching his teammate retire with an alternator problem, and suffering through his own niggles on the RB9 as well. Nevertheless, the race win was his, three in a row at the Buddh circuit, and the victory granted him his fourth consecutive title. Vettel now becomes the youngest four-times world champion, and joining an elite group of only three others who have done the same. On the podium, Vettel controlled his emotions enough to thank the fans and his team. I'm speechless, I don't know. I crossed the line, I was empty. It's one of those moments you wish to say so many things, you can't. Phenomenal season. The spirit inside the team is so strong, it gives me so much power. It's a pleasure to jump in the car, go out for the guys, and give it all I have. The car was phenomenal today, phenomenal all season. I couldn't ask for more. 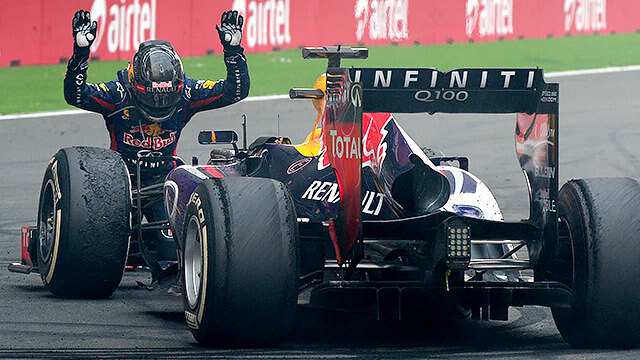 Red Bull also wrapped up the constructor's championship, matching Vettel's four consecutive titles with their own. Adrian Newey took to the podium for the trophy as Helmut Marko watched on from the ground with a celebratory Vettel t-shirt on. Team principal Christian Horner afterwards paid tribute to the outfit as a whole. To achieve four double World Championships is the culmination of an enormous amount of dedication and commitment from the whole team. For Sebastian to have joined the illustrious names of Fangio, Prost and Schumacher is an incredible achievement, especially at such a young age and it's a privilege to work with him. It's an enormous day for the Team to have won its fourth consecutive Constructors' World Championship. With three races left to run, both Red Bull and Vettel can increase their points scores, but the pressure is off. Barring any unforeseen incidents, both will be awarded their respective championships at the FIA gala in December.